"Sampath Speaking" - the thoughts of an Insurer from Thiruvallikkeni: Maria Angela Di Trapani, (the real Sornakka) arrested !! Maria Angela Di Trapani, (the real Sornakka) arrested !! Nayakan, directed by Mani Ratnam based on the Bombay don Varadaraja Mudaliar ran packed houses and was a trend setter after which many movies hailing Dons came. The theme of the film was inspired from Mario Puzo's novel The Godfather. Released almost 15 years earlier, ‘Godfather’ directed by Francis Ford Coppola based on Mario Puzo's best-selling eponymous novel, starred Marlon Brando and Al Pacino as the leaders of a fictional New York crime family. The story, spanning 1945 to 1955, chronicled the family under the patriarch Vito Corleone (Brando), focusing on the transformation of Michael Corleone (Pacino) from reluctant family outsider to ruthless mafia boss. Arumugam (Vikram) lives in a village and is a kind hearted man. There is a chemical factory in the village which releases toxic wastes into the river and the villagers decide to give a petition to the minister requesting him to close the factory. As Arumugam fights for the villager’s cause, Sornaka (Telangana Shakunthala) and her brother Aadhi (Pasupathy) are local goons involved in many illegal activities with the minister Kaalaipandi supporting them behind. That was the storyline of ‘Dhool’ 2003 film directed by Dharani starring Vikram, Jyothika and Reemma Sen in the lead roles. Telangana Shakuntala (born in Maharashtra) played many characters in Telegu but attained more fame with that Sornakka character. Miles away, particularly in Sicily, Mafias are for real though many myths surrounding them are not. The Mafia is oppression, arrogance, greed, self-enrichment, power and hegemony above and against all others. It is not an abstract concept, or a state of mind, or a literary term... It is a criminal organization regulated by unwritten but iron and inexorable rules... The myth of a courageous and generous 'man of honour' must be destroyed, because a mafioso is just the opposite." - Cesare Terranova, Italian Magistrate murdered in 1979.. whether you like it or not – mafia does exist. It is a symptom of Sicily's endemic political corruption and a general cynicism regarding public institutions and the criminal justice system, its life sustained by a widespread mentality which breeds a general distrust in even the youngest Sicilians - distrust of everybody and everything. Now this post is about the real ‘Sornakka’ - Maria Angela Di Trapani, if you have not heard her name earlier. 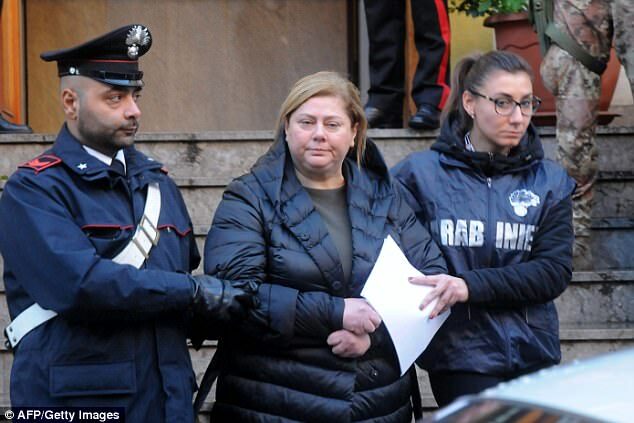 MailOnline reports that a female mobster suspected of being the mastermind behind a reshuffle of the Sicilian Mafia following the death of 'boss of bosses' Toto Riina has been arrested, Italian police said on Tuesday. Maria Angela Di Trapani, the daughter of a fugitive, has already spent seven years in prison for having passed the orders of her husband, a convicted mobster, from behind bars to the clan on the outside. Her husband, Salvino Madiona, is serving life for the 1991 murder of renowned anti-Mafia businessman Libero Grassi, who was gunned down for attempting to persuade Sicilians to stand up to the mob. Maria Angela Di Trapani, a female mobster suspected of being the mastermind behind a reshuffle of the Sicilian Mafia following the death of "boss of bosses" Toto Riina, is escorted by carabinieri during a police operation today. Riina, who was nicknamed 'The Beast' because of his cruelty, died last month and his presumed heir Matteo Messina Denaro is on the run. Di Trapani, who was freed in 2015, is suspected of having since scaled the rungs of the crime group - nicknamed 'the octopus' for its tentacled reach into all areas of society - from messenger to boss, according to wiretaps obtained by the police. 'Once released, she immediately returned to Cosa Nostra and took up a decisive role,' prosecutor Salvo De Luca told a press conference. Police said jailed bosses had appointed Di Trapani to head up the Madonia clan and tasked her with liaising with other clans on the relaunch of Cosa Nostra following Riina's death. It is further reported that 25, including Ignazio Calderone were arrested on Tuesday in a sting involving over 200 policemen, helicopters and sniffer dogs. Those arrested are accused of mafia association, extortion and shifting stolen goods. The arrests 'reveal how Cosa Nostra, though weakened by investigations and trials, still has an enduring capability to use intimidation to force businesses to pay (the mafia tax) pizzo', police said in a statement. The 'Addiopizzo' ('Goodbye Pizzo') association, which campaigns to end the payment of protection money, on Tuesday urged Sicilian entrepreneurs and shopkeepers to stand up for their rights and denounce extortionists. The woman mafia killed Riina was serving 26 life sentences. Riina's most high-profile ordered hits were the assassinations in 1992 of anti-mafia judges Giovanni Falcone and Paolo Borsellino, who had worked fearlessly to bring more than 300 mobsters to trial in 1987. Di Trapani hit the headlines in 2000, when she conceived a child with her husband despite the draconian detention conditions he was being held under. In 2007, despite backing from a court, the prison refused to allow the couple to have a second child by artificial insemination.